Have you been told you’re creative? Maybe you just can’t stand to sit still without a project at hand. Either way, you should explore a career as a fine artist! Fine artists create unique art pieces using sculpture, painting or illustration. They create new concepts and ideas conveyed in their art and technique. Most fine artists are self-employed, requiring some business knowledge including basic accounting. Qualities you should cultivate include creativity, artistic ability, manual dexterity, customer service skills, marketing and sales skills and interpersonal skills. Some art materials can release vapors, so working in a ventilated area with good filtration will protect your health. Formal education in the arts is beneficial for fine artists, either in certificate programs or by pursuing a degree in fine arts. Many programs are accredited by the National Association of Schools of Art and Design. Education provides an opportunity to explore new media and develop a portfolio, essential when pursuing work after finishing your program. Once you have finished your educational program and developed a portfolio of your work, ongoing training through workshops, classes or private instruction will help you keep your skills current. If you receive a job at a business, you will probably be given basic tasks while observing other artists in the company and honing your own talents. 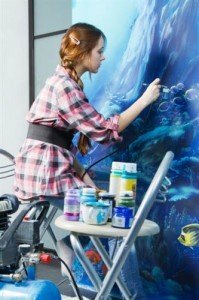 Many artists work an additional job until they become established as a professional artist, usually after their work circulates and evolves into a unique style. If you love working with and maintaining antique records and documents, you could have a future exploring the past as an archivist. Do you like tying a variety of things together into one cohesive artistic statement? Try working as an art director! Curators, museum technicians and conservators oversee collections and perform repairs and preparations for an item to go on exhibit. Fashion designers develop designs for new clothing, footwear and accessories. If you like conveying ideas through visual media, you may enjoy working as a graphic designer. Do you have great ideas for new products? Industrial designers plan and develop manufactured products. Jewelers and precious stone and metal workers plan, craft and market new jewelry in addition to fixing, appraising or adjusting customer’s pieces. If visual effects, models and animations are your thing, you might check out working as a multimedia artist and animator. Can you lay out a still composition? Photographers take still images of a variety of subjects and environments. Do you like to share your skills with others? Self-enrichment teachers provide continuing education in a large range of interests. If the smell of sawdust and varnish make you happy, a career as a woodworker may be worth exploring. The average hourly pay for a fine artist was $21.56 in May 2010. Many artists are self-employed, with widely-ranging fees, while others do not rely on fine arts alone for their main income. During busy times, such as preparing for an art show or when under a deadline, fine artists may work overtime. Job prospects for fine artist are expected to grow at about 8% over the next decade, slightly slower than the average for all career paths. Economic conditions can also cause changes in opportunities for artists, as people are less likely to purchase art during difficult times and charitable foundation giving is also lessened, with the reverse being true during good economic conditions. Competition for positions is expected to remain strong, with competition for gallery showings and grants remaining particularly intense.